I have always had a passion for dogs and have lived with them for most of my life. Photographing them can be challenging but when it comes together naturally it’s a beautiful thing! Several of the breeds that I have owned frequently land between the pages of Breed Specific Legislation. That poorly thought out, often contentious piece of appearance based legislation that targets a growing list of dog breeds purely on how they look. If your breed isn’t on it, don’t be too complacent, once in place it has the capability of quietly growing. 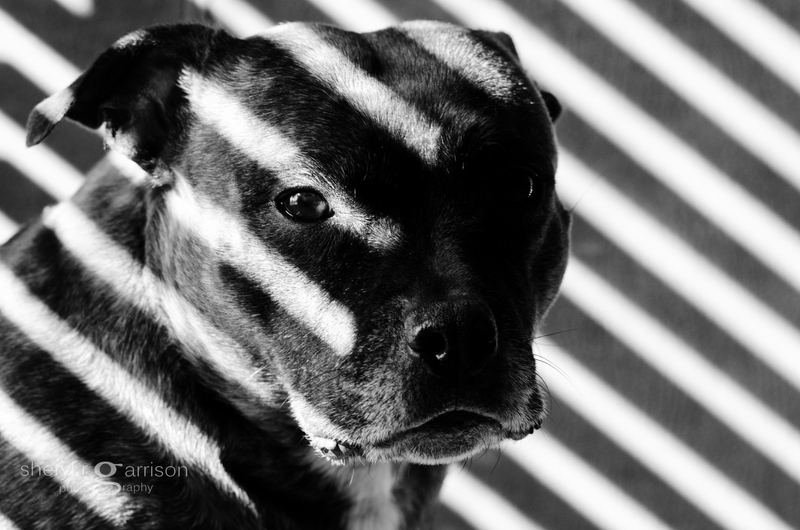 As a photographer and owner of Staffordshire Bull Terriers, I am very conscious of the images that I share of this breed; always scrutinizing them for what someone might ‘see’ in them and choose to tagline as vicious. She could be running joyfully towards me with that ‘grin’ that all owners of this breed recognize but to the uneducated or the one with an agenda, publishing that image might just add fuel to the fire when taken out of context. It is unfathomable to me that there are cities in this country and in the one to my North, where should I venture into those places with this dog, she could actually be confiscated. Did I mention that in England they are called the Nanny Dog, they are especially good with children and that this particular dog lives with a fluffy white kitty? On this day she sat quietly watching me as sunlight streamed through the wooden blinds and calling out a quick ‘stay’ I reached for my camera which is always close at hand. For me it was a moment that captured the look of prejudice and each time I see it I am compelled to remember never to judge a book by its cover. Very good. I love that sweet face. Verna. Thanks Verna, you know how fond she is of you! I had no idea of this discrimination, and shall continue to love staffies (and all dogs) with an innocent heart. A very thought-provoking picture and message. Pictures do let us have a different view of things. I loved last week’s picture as well. He looks so happy and content. Thank you Judy, you’re right, context can be very important. So sorry for the news about Gulliver, I will keep you both in my thoughts. Dogs impact our lives in so many positive ways. Tula is used to being a model for me and most times all it takes for her to hold a pose is for me to hold up one finger! There must be a growing backlash against the automatic branding of a specific breed. South Bend, Indiana recently rescinded its legislation that had “special” rules regarding Pit Bulls. My friends and I have often commented that the “dog” problem is most often the person who owns it. Beautiful portrait of your friend. That’s very good news in the fight against BSL, thank you for sharing this!